[New for 2013, 2nd St has closed up shop before the 2015 ice cream season] Now I haven't mentioned it yet, but Blue Bunny sent a big ol' free shipment of ice cream last week and I've been having trouble deciding which treat to dig in to first.... how about we dig into a 2nd St Creamery flavor that I've never seen before. This is 2nd St. Creamery Can't Tell Me No! Cookie Dough ice cream. It's cookie dough flavored ice cream with cookie dough swirl and chunks of chocolate and chocolate chip cookie dough. Oh, and that's a spoon in the graphic on the left (in case you are like me and can't really tell at first). 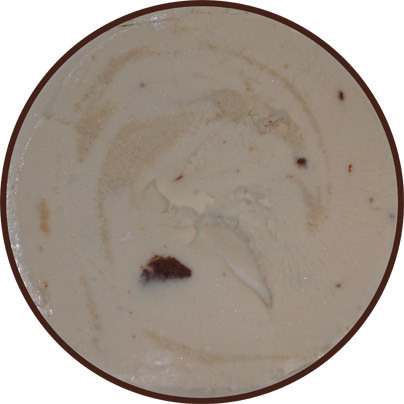 Opening the pint is like looking at a blank slate, but dig down a little and you will be greeted by one very cool looking cookie dough swirl. 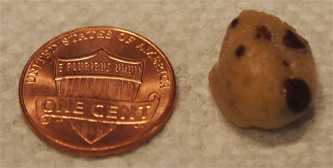 See, "cookie dough swirl" is one of those things you read, but it doesn't really sink in at first. In this case, it's literally a solid cookie dough swirl. I actually managed to scoop some of it out, wash it off, and attempted to photograph it because it's just that thick. It's not just some gooey swirl, or even some gritty swirl, it's a literal solid object (hope that makes sense). When you dig in, the first thing you will notice (and never forget) is the very sweet brown sugar flavoring of this ice cream. 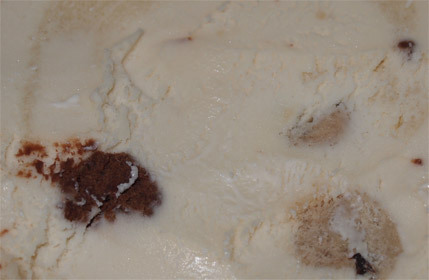 Brown sugar is literally listed on the ingredient list three times as it's in the revel (swirl), the cookie dough, and the base. 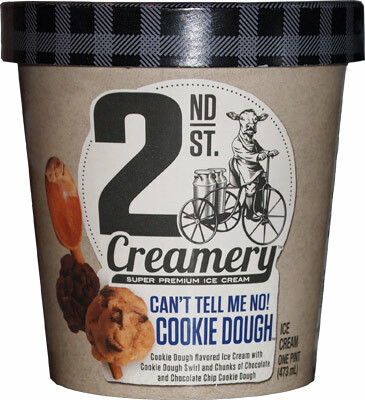 You know how Turkey Hill tries to make the most unique main stream cookie dough by flavoring the base, well 2nd St is trying that same idea to try and make this the most unique premium cookie dough pint out there. At the very least, they're getting an A for effort on this one. The cookie dough is nice, no complaints. It's big, it's got the chips mixed in, and it's fairly flavorful. I say fairly because with the base and the swirl so strong, it makes the cookie dough balls seem a little tame. Ok, one more shot to get you going. I got plenty of cookie dough in my pint but the chunks of chocolate weren't too numerous. It could just be my pint, maybe you'll get more, but for me they are just incidental and just give the occasional burst of of chocolate cookie dough. Oh, side note before I go, this one kind of had that very solid 2nd St texture that I've noticed before. I can't just whip this one out of the freezer and dig in, it needs a few moments to soften up a little. The cow riding the buggy on the carton is creepy looking. He/she looks like Yoda from Star Wars.